This article concentrates on sectarianism as conflict between groups. For sectarianism as a characteristic of sects, see sect. Wherever people of different religions live in close proximity to each other, religious sectarianism can often be found in varying forms and degrees. In some areas, religious sectarians (for example Protestant and Catholic Christians) now exist peacefully side-by-side for the most part, although these differences have resulted in violence, death, and outright warfare as recently as the 1990s. Probably the best-known example in recent times were The Troubles. 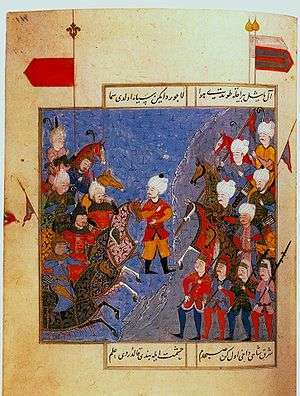 Within Islam, there has been conflict at various periods between Sunnis and Shias; Shi'ites consider Sunnis to be damned, due to their refusal to accept the first Caliph as Ali and accept all following descendants of him as infallible and divinely guided. Many Sunni religious leaders, including those inspired by Wahhabism and other ideologies have declared Shias to be heretics and/or apostates. Since the 12th century there has been sectarian conflict of varying intensity in Ireland. This religious sectarianism is connected to a degree with nationalism. This has been particularly intense in Northern Ireland since the early 17th century plantation of Ulster under James I. Sectarian tensions can be found in other regions of the British Isles to this day, including Scotland (with some fans of football clubs such as Celtic and Rangers indulging in sectarian chants) (see: Sectarianism in Glasgow), Liverpool, Birmingham and elsewhere. In most places where Protestantism is the majority or "official" religion, there have been examples of Catholics being persecuted. In countries where the Reformation was successful, this often lay in the perception that Catholics retained allegiance to a 'foreign' power (the Papacy), causing them to be regarded with suspicion. Sometimes this mistrust manifested itself in Catholics being subjected to restrictions and discrimination, which itself led to further conflict. For example, before Catholic Emancipation was introduced with the Roman Catholic Relief Act 1829, Catholics were forbidden from voting, becoming MP's or buying land in Ireland. 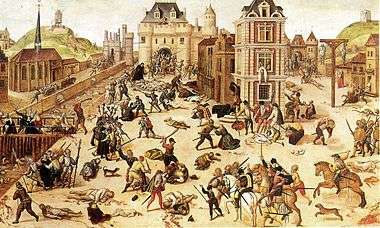 Ireland was deeply scarred by religious sectarianism following the Protestant Reformation as tensions between the native Catholic Irish and Protestant settlers from Britain led to massacres and attempts at ethnic cleaning by both sides during the Irish Rebellion of 1641, Cromwellian conquest of Ireland, Irish Rebellion of 1798 and the Home Rule Crisis of 1912. The invasion of Ireland by English parliamentarian forces under Oliver Cromwell in 1659 was notoriously brutal and witnessed the widespread ethnic cleansing of the native Irish. The failure of the Rebellion of 1798, which sought to unite Protestants and Catholics for an independent Ireland, helped cause more sectarian violence in the island. The British response to the rebellion, which included the public executions of dozens of suspected rebels in Dunlavin and Carnew, along with other violence perpetrated by both the British and the rebels, helped end the hope that Protestants and Catholics could work together for Ireland. After the Partition of Ireland, Northern Ireland witnessed decades of intensified conflict, tension, and sporadic violence between the dominant Protestant majority and the Catholic minority, which in 1969 finally erupted into 25 years of violence known as “The Troubles” between Irish Republicans who favoured a United Ireland and the British state along with Ulster Loyalists who wished to remain a part of the United Kingdom. The conflict was primarily fought over the existence of the Northern Irish state rather than religion, though sectarian relations within Northern Ireland fueled the conflict. However, religion is commonly used as a marker to differentiate the two sides of the community. The Catholic minority primarily favoured the nationalist goal of unity with the Republic of Ireland while the Protestant majority favoured Northern Ireland continuing the union with Great Britain. Sectarianism in Australia is a historical legacy from the 18th, 19th and 20th centuries, between Catholics of mainly Celtic heritage and Protestants of mainly English descent. Pakistan, one of the largest Muslim countries the world, has seen serious Shia-Sunni sectarian violence. Almost 80 - 85 of Pakistan's Muslim population is Sunni, and another 10 - 20% are Shia. However, this Shia minority forms the second largest Shia population of any country, larger than the Shia majority in Iraq. Sectarianism has been described as a characteristic feature of the Syrian civil war. The sharpest split is between the ruling minority Alawite sect, a Shiite Muslim offshoot, and the country's Sunni Muslim majority, mostly aligned with the opposition. As of 2015, Saudi Arabia is openly supporting the Army of Conquest, an umbrella group of anti-government forces fighting in the Syrian Civil War that reportedly includes an al-Qaeda linked al-Nusra Front and another Salafi coalition known as Ahrar al-Sham. Syria entered the conflict in June 1976, in order to avoid a PLO takeover of Lebanon – Syria’s entry into the war resulted in a de facto division of the country into zones controlled by Syria, the PLO, and Maronite militias. Shi’a militias were also created, including the formation of Amal in the late 1970s and later when some Amal militants decided to create a more religious Shi’a militia known as Hezbollah (Party of God). See Wikipedia page on Hezbollah. The Syrian Conflict which began in 2011 when clashes began between the Assad government and opposition forces has had a profound effect on sectarian dynamics within Lebanon. In November 2013, the United States Institute of Peace published a Peace Brief in which Joseph Bahout assesses how the Syrian crisis has influenced Lebanon’s sectarian and political dynamics. Bahout argues that the Syrian turmoil is intensifying Sunni-Shia tensions on two levels: “symbolic and identity-based on the one hand, and geopolitical or interest based, on the other hand." Syria’s conflict has profoundly changed mechanisms of inter-sectarian mobilization in Lebanon: interest-based and “political” modes of mobilization are being transformed into identity-based and “religious” modes. Bahout notes that this shift is likely due to how these communities are increasingly perceiving themselves as defending not only their share of resources and power, but also their very survival. As the conflict grows more intense, the more the sectarian competition is internalized and viewed as a zero-sum game. Perceptions of existential threat exist among both the Shiite and Sunni communities throughout Lebanon: the continuation of the Syrian conflict will likely increase these perceptions over time. In the political realm, to describe a group as "sectarian" (or as practising "sectarianism") is to accuse them of prioritizing differences and rivalries with politically close groups. An example might be a communist group who are accused of devoting an excessive amount of time and energy to denouncing other communist groups rather than their common foes. The Monty Python film The Life of Brian has a well-known joke in which various Judean groups, indistinguishable to an outsider, are more concerned with in-fighting than with their nominal aim of opposing Roman rule. ↑ "John F. Kennedy and Religion". Retrieved 29 July 2015. ↑ "Lahore bomb raises sectarian questions". BBC News. January 10, 2008. Retrieved May 23, 2010. ↑ "HTR - Day of Reflection - Home". Retrieved 29 July 2015. ↑ "Healing Through Remembering". Retrieved 29 July 2015. ↑ "Central African Republic: Ethnic cleansing and sectarian killings". Amnesty International. February 12, 2014. ↑ "Pakistan - International Religious Freedom Report 2008". United States Department of State. Retrieved 2013-04-19. ↑ "Pakistan, Islam in". Oxford Centre for Islamic Studies. Oxford University Press. Retrieved 2013-04-19. Approximately 97 percent of Pakistanis are Muslim. The majority are Sunnis following the Hanafi school of Islamic law. Between 10 and 15 percent are Shiis, mostly Twelvers. 1 2 The Christian Science Monitor. "Shiite-Sunni conflict rises in Pakistan". The Christian Science Monitor. Retrieved 29 July 2015. 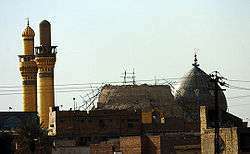 ↑ "Iraqi Sunnis demand abuse inquiry". BBC News. November 16, 2005. Retrieved 2007-05-12. ↑ "Jihadis likely winners of Saudi Arabia's futile war on Yemen's Houthi rebels". The Guardian. 7 July 2015. ↑ "Gulf allies and ‘Army of Conquest’". Al-Ahram Weekly. 28 May 2015. 1 2 Bahout, Joseph (18 November 2013). "Sectarianism in Lebanon and Syria: The Dynamics of Mutual Spill-Over". United States Institute of Peace. ↑ Hirst, David (2011). Beware of Small States: Lebanon, Battleground of the Middle East. Nation Books. p. 2. 1 2 3 4 5 Makdisi, Ussama (2000). The Culture of Sectarianism: Community, History, and Violence in Nineteenth-Century Ottoman Lebanon. Berkeley: University of California Press. p. xi. ↑ Makdisi, Ussama (2000). The Culture of Sectarianism: Community, History, and Violence in Nineteenth-Century Ottoman Lebanon. Berkeley: University of California Press. p. 2. 1 2 3 4 5 Salamey, Imad (2014). The Government and Politics of Lebanon. London: Routledge. p. 57. ↑ Rogan, Eugene (2009). The Arabs: A History. New York: Basic Books. p. 242. 1 2 3 4 5 "Lebanon: The Persistence of Sectarian Conflict". Berkley Center for Religion, Peace, and World Affairs: 5. 2013. ↑ Rogan, Eugene (2009). The Arabs: A History. New York: Basic Books. p. 382. ↑ Rogan, Eugene (2009). The Arabs: A History. New York: Basic Books. p. 411. ↑ Saseen, Sandra (1990). The Taif Accord and Lebanon's Struggle to Regain its Sovereignty. American University International Law Review. p. 67. ↑ Rogan, Eugene (2009). The Arabs: A History. New York: Basic Books. p. 460. ↑ Holmes, Oliver (21 March 2014). "Three dead in north Lebanon in spillover from Syria war". Reuters. Retrieved 8 April 2014. ↑ Ryan, Missy (27 March 2014). "Syria refugee crisis poses major threat to Lebanese stability: U.N.". Reuters. Retrieved 6 April 2014.